Our landscape this August is dominated by vibrant yellow color lining the roads, blanketing many of the open fields, and winding like shimmering rivers flowing between wooded areas. Most of this color results from the abundant blooms of an annual wildflower, the golden crownbeard, also called cowpen daisy or butter daisy. A member of the aster, daisy, or sunflower family (botanically, the family Asteraceae, a very large group of plants often called “composites”), its scientific name is Verbesina encelioides. Verbesina suggests that the leaves resemble those of verbena and encelioides probably is derived from Enkelados, a giant of Greek mythology with 100 arms. The golden crownbeard plant is easily recognized by its overall shape, a single stem that branches multiple times as the plant ages, resulting in many flowers on each individual plant. The leaves are also distinctive: the blades are somewhat triangular, 2”–4” long, with toothed edges, the leafstalks sometimes have wings where they join the stem, and the leaves and stems are covered with woolly hairs that give the plant a gray-green hue. The yellow flowers appear July - September and may grow to be about 2” across. Actually the flowers of all plants in this family are clusters of dozens of very small flowers packed together in a “head” (hence the name composites). Golden crownbeards typically have about 12 outer flowers (ray flowers), each with one conspicuous petal that has characteristic clefts on its outer edge. The numerous tiny inner flowers (disk flowers) are also yellow and have inconspicuous petals. As is usually the case with plants that are somewhat odoriferous, golden crownbeards have traditional medicinal applications, most commonly for the treatment of skin ailments and spider bites. It has also been reported that Navajos would chew the petals to insure good fortune when hunting. Along the same lines, some native peoples placed the flowers on their homes and their heads to ward off lightning. Although its abilities to help us in such ways may be questioned by some, the golden crownbeard has the undeniable ability to brighten our surroundings and lift our spirits each year in late summer. A Botanical View – Is golden crownbeard a sunflower? Sunflower is the common name for plants that are classified in the genus Helianthus. Helianthus is one of approximately 1500 genera (which include about 23,000 species) in the family Asteraceae worldwide. Members of the genus Helianthus are distinguished from the other genera in the family based on some rather technical features of the small structures found under the base of the flower heads and in the pattern of development and structural features of the fruits/seeds that form from the flowers. 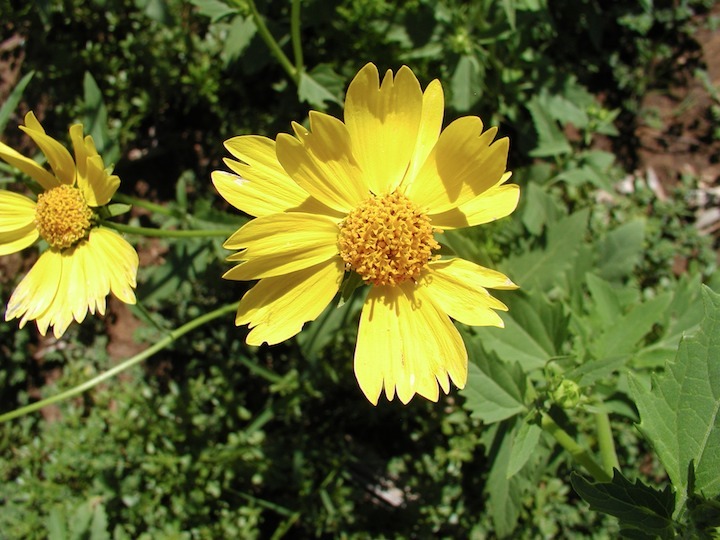 The golden crownbeard (genus Verbesina) does not share these characteristics with true sunflowers so botanically speaking it is not a sunflower. However some people may think of golden crownbeard as a sunflower for two reasons. First, no rules apply to common names, consequently such names are often local, variable, and misleading; in effect non-scientists are free to call any plant whatever they please. A second, more legitimate reason for some confusion is that the family Asteraceae is often referred to as the sunflower family. Probably the best way to think of it is that the golden crownbeard is a close relative of sunflowers, but not a true sunflower itself. Incidentally there are 52 different North American species in the genus Helianthus, 12 of which are native to New Mexico. To date I have only seen Helianthus annus, the Kansas, or common sunflower, growing at Deer Canyon. Field of golden crownbeards at Deer Canyon Preserve.